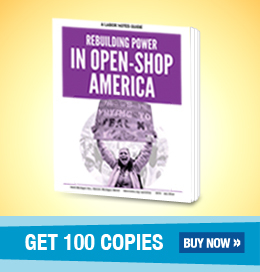 #22: Choose an Issue That’s Widely Felt: A good organizing issue is one that affects many people. Half the clerical workforce cared enough about the dress code crackdown to not only attend a meeting, but also take action together the next day. #27: Actions Speak Louder than Words: Although grievances, unfair labor practice charges, and negotiations were all in their toolkit, these workers found that their most effective weapons were group stunts in the workplace that drew attention and undermined managers’ authority. #31: Keep the Boss Off Balance: Managers like routine. They like to know that what happened yesterday will happen today and that no one is thinking too hard about it. You can make them nervous simply by doing something different, even something normal that would be unthreatening to the non-managerial mind. #35: Prepare for the Worst: Since the workers had talked beforehand about how management might retaliate and how they should react, they weren’t thrown by it. Even when everyone was written up and docked pay, they felt confident they had the upper hand. 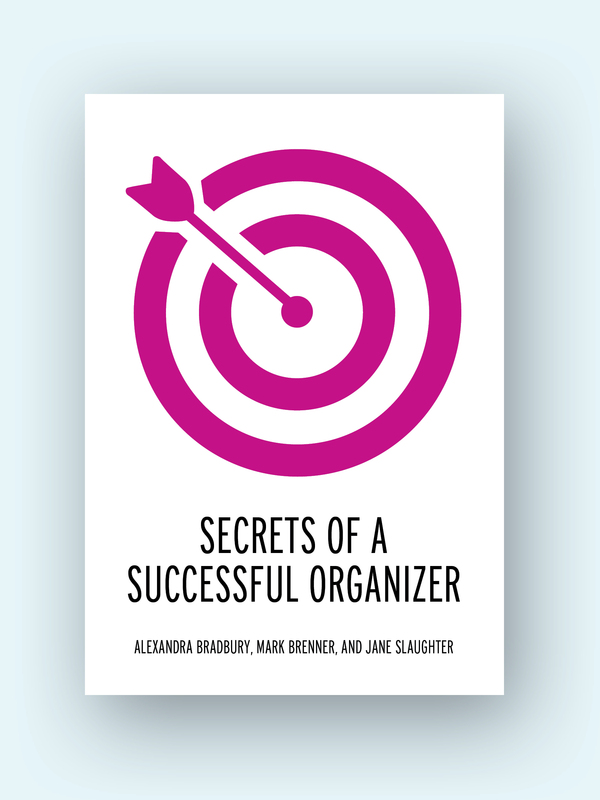 Read more in Secrets of a Successful Organizer ($15), labornotes.org/secrets. In a county in northeast Michigan, Service Employees (SEIU) members at a state agency were coming up on contract time. The unit was composed of 33 clerical workers, only a few of whom had contact with clients. The rest worked in the back office and had enjoyed a very relaxed dress policy for decades. Recently the head of the agency had been replaced with a very young attorney, in her second or third job out of law school, who was eager to make an impression on her political supervisors. She started making changes by dictate. As a union staffer I was assigned to talk with these employees and negotiate the contract. We had a lot of discussion about how to rally the troops behind our proposals. Since the members knew their rights under the contract and the law, they began to challenge the agency head’s decisions. The chief steward, Susie, typically worked in the back of the operations but one day was reassigned to work up front to deal with the public. Susie had injured her foot and was wearing tennis shoes and casual clothing. This really upset the agency head, who sent her home to change. Susie was docked two hours’ pay. I told her, “You were following a direct order,” and suggested she write a grievance. She did. This really upset the agency head, who responded by starting to tell people that no matter where they worked, they had to up their dress to be more professional. Susie’s foot injury continued to bother her and she came in with tennis shoes again. Meanwhile, another employee in the back office had sprained her leg and was wearing sweatpants. The agency head got angry, called everybody together, and read them the Riot Act. She told them they had to wear professional attire: suits. I got a call and went in. I advised the angry members that telling someone they could either toe the line or get another job was interference with their rights to negotiate. I discussed filing an unfair labor practice. I pointed out that if everyone wore their husband’s suit, it would be collective activity and therefore legally protected. Plus, they would be following a direct order. The 15 or 20 women enthusiastically agreed to all wear their husbands’ suits to work the next day. I warned that the agency head was likely to threaten them and write them up. Don’t worry about it, I said. We can file a grievance, we can bring it up in bargaining, we can file an unfair labor practice charge—and we can engage in collective activities before and after work. Bring a camera and document everything. By the time the agency head walked in at her leisurely 10 a.m. start time, everyone in the county building knew what was going on. When other employees in other departments saw laughing women walking down the hall, word spread. A lot of the senior judges, little old men who were used to telling people what to do and having those people follow without question, found it a great embarrassment. A judge went to tell the agency head to whip her people into line. Everyone was written up and docked pay. A couple of the women talked to a reporter later in the day and there was a blurb in the local paper. When I went to the scene, knowing that the agency head had threatened to fire Susie, I thought it would be a tension-filled meeting with the members. Everyone had been sent home. It was the first time they’d done anything like this. But when we met at a hamburger joint, everybody was laughing. One woman talked about her husband weighing 300 pounds while she weighed 119. They were rolling in the aisles. We continued to do activities throughout the duration of the bargaining. The agency had always given a five-minute grace period for reporting back to work after lunch, no strings attached. Now the assistant agency head (affectionately known as the Time Nazi) started standing at the door with her clipboard to check people off at 1 p.m.
One week the women decided they’d stand in the hall outside the office (silent and in single file) to await 1 p.m. On Monday, when the Time Nazi opened the door, everyone stood silent for one minute before entering. On Tuesday they waited two minutes, on Wednesday, three, on Thursday, four, and at the four-and-a-half-minute point on Friday, they all sang “Solidarity Forever” as they marched in. The court building is one of the old Works Progress Administration buildings, with marble slabs on the walls, and their singing echoed all over. It caused quite a stir among the county’s senior management. Not too long after that we got a decent contract, and it did not contain a dress code. All the suspensions were expunged and the docked pay returned; the worst anyone got was a written warning. And once we’d shown her the ropes, the agency head ended up being a fairly decent human being, someone you could talk to. Dennis Albers worked as an SEIU International field representative in Michigan for a number of years. A version of this article appeared in Labor Notes # 461, August 2017. Don't miss an issue, subscribe today. Great article Dennis! I love the fun aspects of these actions.